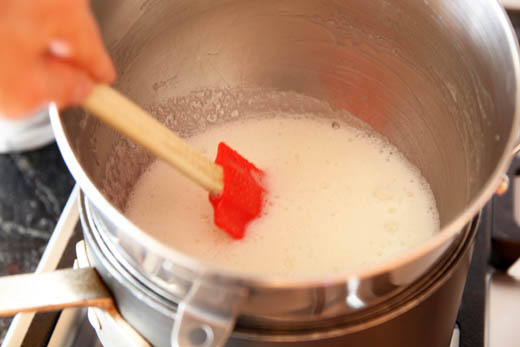 Put the bowl over a double boiler and stir with a rubber spatula until the sugar is completely melted. This can take several minutes. You want to brush the sides down with the spatula to make sure all the sugar is melted and no grains are clinging to the sides. Feel the egg mixture between your fingers to check for graininess. 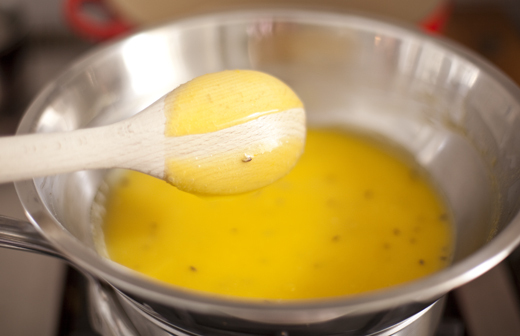 Once it is completely smooth, put it on your stand mixer and beat with the whip attachment on medium high speed. Beat it until it is light, fluffy, glossy and the bowl feels just about room temperature. 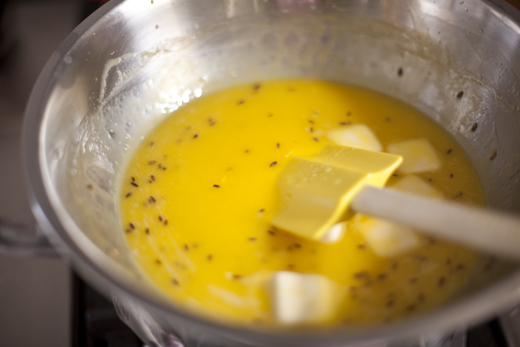 Add the scraped vanilla seeds and whip until they are evenly distributed. 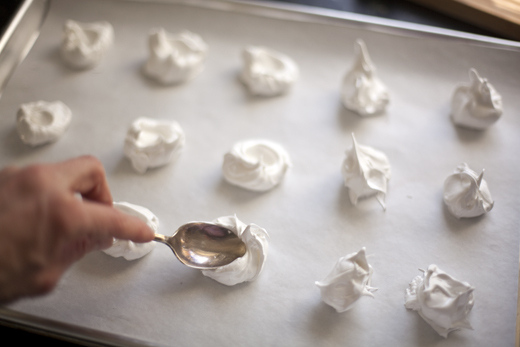 Use a spoon to create mounds of the meringue on the parchment. Wet the spoon and make a well in the center of the mound. 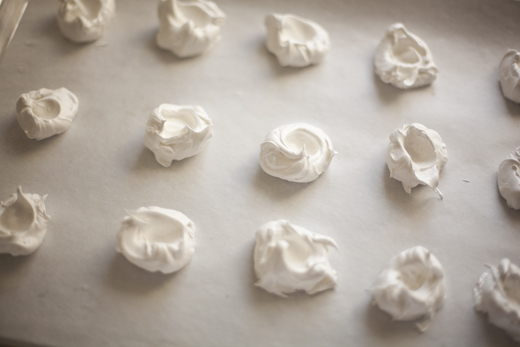 Bake the meringues for an 1 1/2 hours. 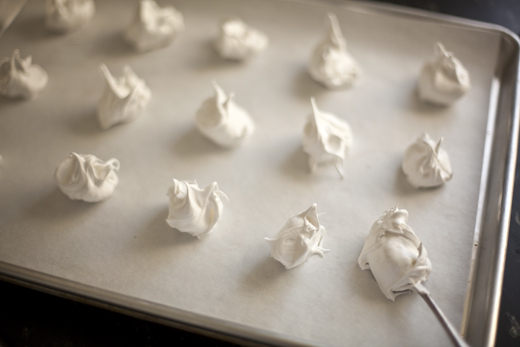 Turn off the heat and allow the meringues to sit in the oven for 30 more minutes. Remove from the oven and let cool completely before filling. 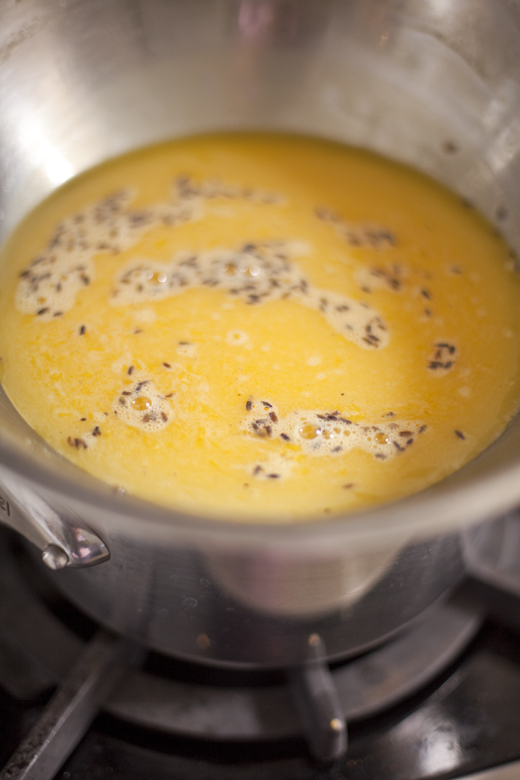 In a bowl set over a double boiler, with an inch of simmering water below, whisk together the yolks, egg, sugar, lemon juice, zest and lavender. It is thick enough to coat the back of a spoon. When you draw a line through the curd, it should be thick enough to stay put. 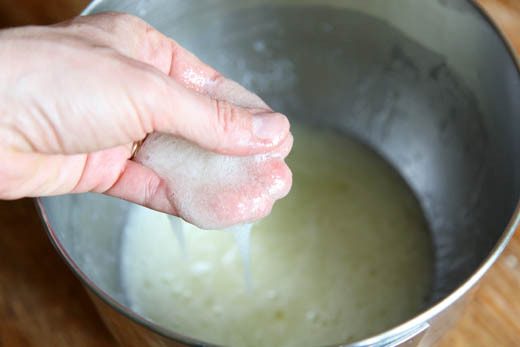 Strain the curd into a container, cover with plastic (place it directly on the surface of the curd, to prevent a thick skin from forming) and place in the freezer for about 15 minutes or until cool, but not frozen. 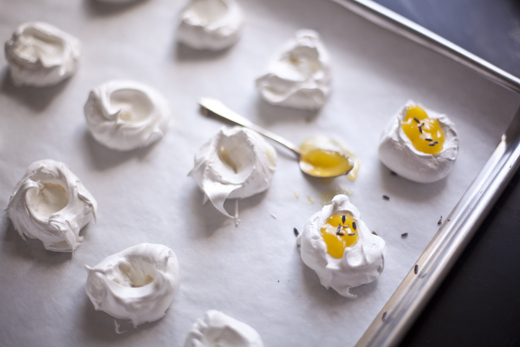 Once it is cooled, fill the meringues with the lemon-lavender curd. Sprinkle with the lavender buds and serve. it’s interesting of your recipe. You should have made these for Easter! these look amazing, i love all these textures and flavors! Hi Zoe! Thanks SO much for clearing up the meringue issue! 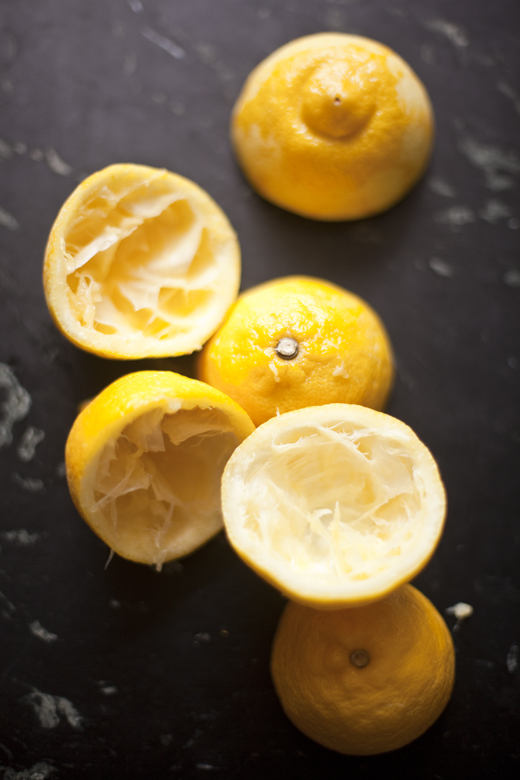 I’ve been looking for the perfect creamy meringue to go with lemon curd. I tried French and Italian, and Italian was quite creamy- but I can’t wait to try the Swiss! we had these seder dinner and they were scrumptous! 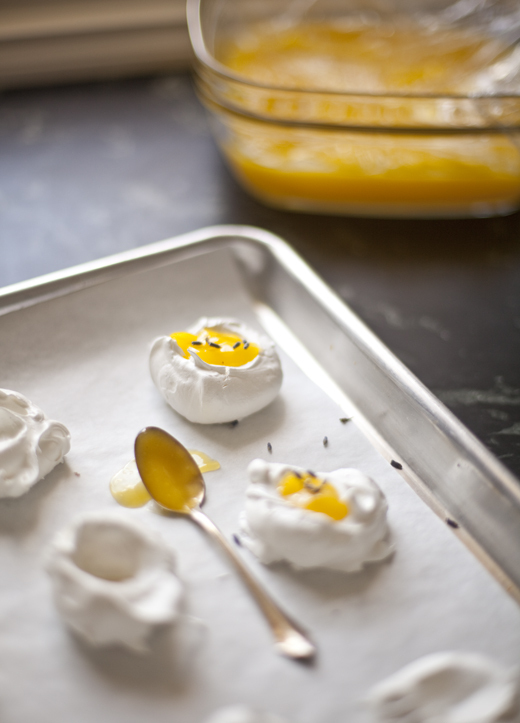 Your meringues look gorgeous and I love the idea of the lemon curd fillings! These look like little eggs! Tthanks for the introduction to the different types of meringues. Very useful! Glad i’ve found your blog!! 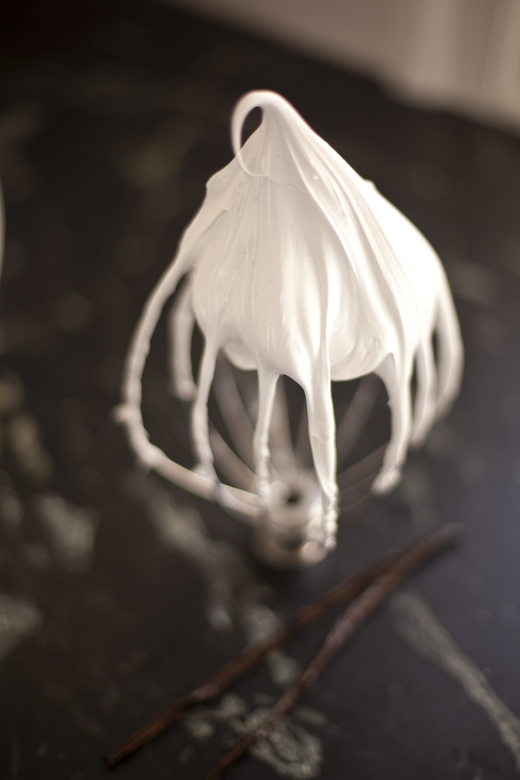 long live the meringues….and hello from Italy! 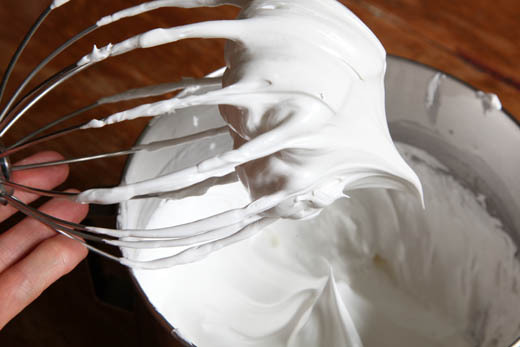 what is the ratio of egg white to sugar in the Swiss Meringue? It is 1 cup whites to 2 cups sugar. These look stunning! I’m always after different ways to use lavender in my cooking so that it does a little more than smell nice in the garden, this recipe is perfect! Hi, I was wondering about how many meringues does this recipe yield? and the curd? It depends on how large you make the meringues. I got about 30 2-inch meringues and enough curd to fill them, plus more to enjoy on toast! Do you recommend refrigerating the leftovers or are they ok on the counterop? By far my best meringues ever. i don’t normally post but I had to sing it from the roof tops. I normally make meringue the French way which is hit or miss with me, but this way was not hard at all and they came out AMAZING! I am so excited to take them to my pot luck. Thank you for the original post! I am thrilled you made them and enjoyed them! I found these on Pinterest and was mesmerized (as 10k+ other people :-)). 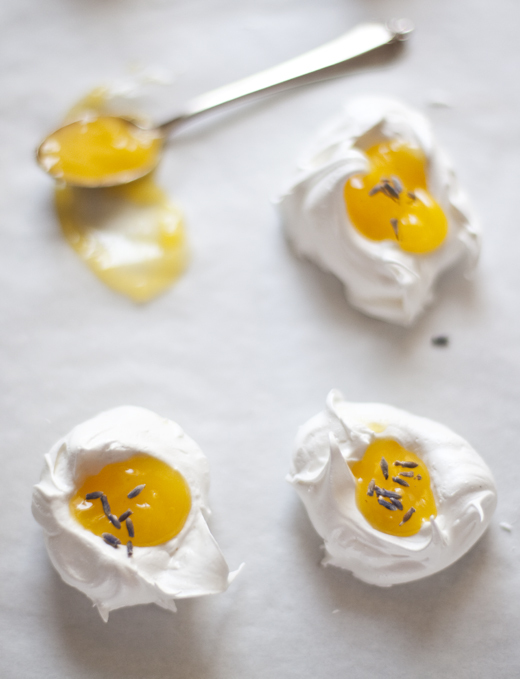 Camouflaged as beautiful poached eggs, these meringues couldn´t be prettier! So glad you found the site on Pinterest!